Although the Home strip was retained from the 2004/05 season, the Away kit was renewed with the chosen style picked out from a selection of ideas by fans representatives. The TFG Sports manufactured polyester shirt was half white, half black, separated diagonally - similar to the iconic design of French club AS Monaco. Although the original design had the sleeves the opposite way around, when the kit was released the white sleeve was on the white side and the black sleeve on the black side. 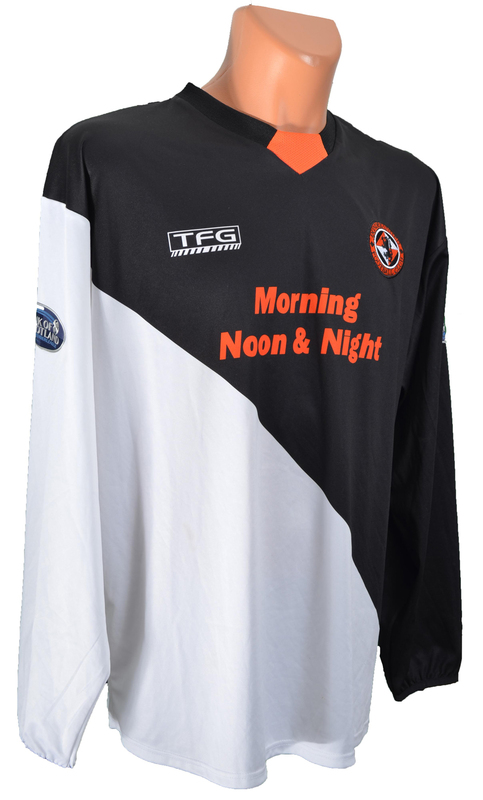 The Morning Noon & Night sponsorship continued for a third season, but with the introduction of a good portion of black on the shirt, the logo was changed from black to a more striking tangerine. The shirt was usually accompanied by white shorts with a black band along the top of the back which continued as a stripe down either side. The socks were always black, with "DUFC" written in white across the front. The new Away kit was first seen during the pre-season Discovery Cup compitition, as United played Sheffield Wednesday at Dens Park. Competitively, it was first seen during United's rain-drenched trip to Finland, as the club returned to Europe for the first time in eight years. The kit was worn again 9 days later, when United and Motherwell played out an unbelievable match at Fir Park, that ended 5-4 in United's favour. The kit was worn for United's visits to Pittodrie and Tynecastle, but for the trips to Livingston, the team stuck with the Home kit. On one occasion, the black shorts of the Home kit was worn with the Away shirt, for United's second trip to Fir Park in February.